Edited 67 times, last by Toguttt ( Sunday, 5:13 pm ). Russia Italian User wrote years were Italian Clubs were Champions, past Clubs don't count. By the way- all List in Uralochka Ekaterinburg thread. sorry, are those just your suppositions or could them be true?? They also had Elena Cebukina. Who was libero in Dubrovnik in '98 ? Someone correct me if I am wrong, but I don't think the FIVB introduced the libero position until the 99-00 season. Libero was introduced in 1998 as far as I know, at least I remember Kerstin Tzscherlich played as libero for Germany in 1998 WCH, but I'm not completely sure. But not all teams started using a libero right away when the rule came, I think Cuba didn't use one until around 2003-04. I stand corrected. it was 1998 indeed. 2nd Champions League in a row for Jordan Larson and 1st one for Neslihan Demir! what? isnt polen part of vakifbank when they won cl in 2013? Sixth (6th!!!) Champions League for Francesca Piccinini! MVP for the 2nd time! 3rd Champions League for Barbolini (1996, 2006, 2016) and 1st time for Kozuch. Edited once, last by Sidney ( May 6th 2018 ). 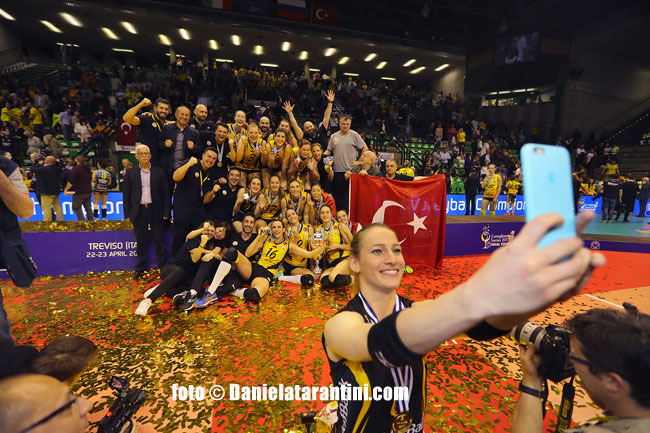 3rd title for Vakifbank Istanbul and Giovanni Guidetti in the last 7 years! Also 3rd Champions League for Naz Aydemir and Gözde Kirdar! Edited once, last by Toguttt ( Apr 25th 2017 ).